Rajahmundry, January 9, (way2newstv.in):Yellow farmers are worried about the festive season when the six-year-old yellow farmers do not get a result of this year's investment. 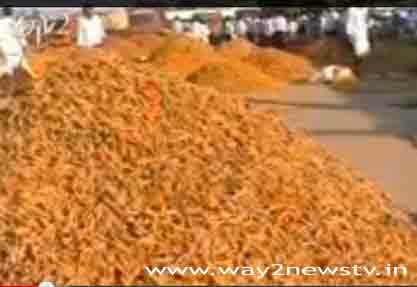 Farmers are furious in this year's Sankranthi festive season. This year, the pricing farmers are deeply concerned about the price hike. The farmers are cultivated in thousands of acres this year in Raghavapalem, Thalumaru, Athreyapuram and Puthupetam Mandalas in the new Pettah district of New Godavari district. This year, the price of yellow tea has fallen to a record price of Rs. Farmers are worried that yellow farmers are at risk of falling in seed prices, fertilizers and labor costs, while farmers are worried about the yellow purchasing power. Yellow pump Adukovalani giving farmers the right to seek cost price.